The unique theater had a successful run for 5 years even though patrons had to go up a narrow flight of stairs. The director moved from the area. Funds from the theater support the Bear River Valley Musuem. The stage is a platform raised from the floor; there are also dressing rooms, a kitchen, and restrooms. The Bear River Valley Theater, above the Bear River Museum at 11 E. Main in Tremonton, has a unique history. Karen Stokes is the Bear River Museum director and she is always looking for ways to fund the museum. 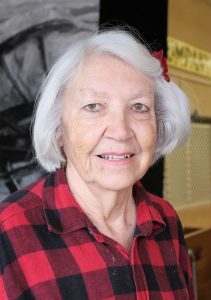 Karen Stokes, the Bear River Museum director said they turned the upper floor of the museum into a theater hoping to raise funds for the museum..
Stokes’ daughter, JuDean Parkinson, went before the museum board five years ago and pitched the idea of turning the upper floor of the museum into a theater. She proposed funds raised from the theater go to the museum. The board took the bait, and Tremonton’s Main Street Playhouse was born. On Feb. 14, 2014 they held their first production, a dinner theater. Parkinson moved with her family to Cedar City last fall, leaving the theater without a director. Until they get someone to run the theater, there is no schedule of plays this year, except a summer theater workshop. Parkinson said she would return to do the summer workshop for children and young adults. It is a unique theater with patrons having to go up a narrow flight of 32 stairs to get to the theater holding about 100 seats. The seats look like choir seats out of church. The stage is a platform raised off the floor; there are dressing rooms, a kitchen, and restrooms. The theater offered a variety of productions not typical of community theaters, but they filled the seats. Stokes said the theater was supported by the community and was successful; there was rarely an empty seat. Parkinson’s productions included melodramas, variety shows, dinner theater, one-act plays, a G-Rated comedy club, and more. The theater group focused on producing top-notch family-friendly productions to uplift and build the community. “The kids love the workshops and it’s good for the community,” Stokes said. The building, built in 1903, started as a furniture store. In 1923, Independent Odd Fellows bought the building and had their meetings upstairs and rented the lower floor to JC Penney. Odd Fellows was a secret society founded in 1819 by Thomas Wildey in Baltimore, Maryland. The Odd Fellows disbanded in Tremonton and the few members left joined the group in Ogden. If someone is interested in operating the theater they should contact Karen Stokes at (435) 854-7406 or Roberta Fronk at (435) 257-3273.